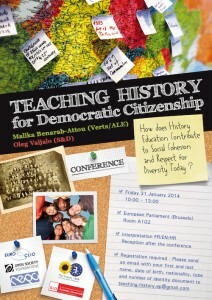 ‘Teaching History for Democratic Citizenship’ poster. At the end of January this year, more than 70 teachers, researchers, students, parents, NGO activists and EU civil servants attended an interesting conference at the European Parliament in Brussels. This event, aspart of the project Making History Work for Tolerance: A Research-Based Strategy to Reduce the Intolerant Usage of History Teaching in the EU was organized by the Network of Education Policy Centers (NEPC) and EUROCLIO – the European Association of History Educators. The event hosted by two Members of the European Parliament: Malika Benarab Attou (Greens, France) and Oleg Valjalo (S&D, Croatia). In political debates about social cohesion, immigration and integration in European countries, arguments related to history often play an ambiguous role. On one hand, studies of the past can provide clues to many social and political questions, but on the other hand, often simplified and manipulated narratives of history serve as reference points for exclusionary and nationalist rhetoric directed against some groups in society, such as immigrants and other minorities. Therefore, the idea of the project is to address the need to reduce political manipulations of history teaching in order to increase tolerance among majority and minority populations (including migrants) in the EU countries and to reduce xenophobia. The project, and the conference itself, aimed to support intercultural dialogue through history teaching in three EU countries: Denmark, Latvia and Slovakia. The hosts of the conference commented on the ambivalent relationship between history and politics, the relationship which becomes even more complex in the context of the European Union, where any attempt to foster a collective remembrance of the past as a transnational level faces limits, as shown by dr. Markus Prutsch from the European Parliament. He believes that this would be easier if we were to be more critical to our own history and more open to “others’” history. “History teaching is about teaching empathy and solidarity” – emphasized Susanna Margret Gestsdottir, former EUROCLIO President, history teacher and researcher. During the conference, the results of the field research undertaken by NEPC and its members were presented. Maria Golubeva (NEPC), Jenny Strid (Danish Association of History Teachers), Linda Curika (PROVIDUS) and Marcela Maslova (Orava Association for Democratic Education) reflected on the uses and abuses of history, and the role history plays in society. 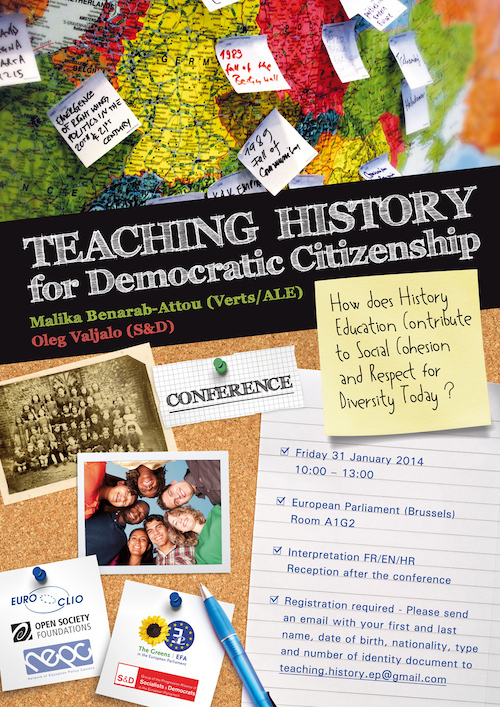 Research findings showed that history curricula in Denmark, Slovakia and Latvia champion critical and reflective history education as a tool for democratic citizenship. But, in the case of Slovakia and Latvia there seems to be the case of discrepancy between the official curriculum and the hidden curriculum, which is still based on a very dogmatic and narrowly nationalistic view of the history. Teachers in Latvia and Slovakia also do not consider themselves well prepared to address the political use of history. Due to that it was concluded that not everything in history is about giving answers, but rather on raising the right questions. Lana Jurko (NEPC) and Blandine Smilansky (EUROCLIO) stressed the role of civil society activism in raising awareness in the society on the unique contribution of history education to the personal, professional and social development of young people. History and citizenship educators are key actors in this process and need to develop a professional ethos that puts the concept of social responsibility and civic engagement at the centre. They finally concluded that educators need tools such as dialogue and collaborative reflection with peers as well as learning opportunities throughout their career in order to be able to fulfil their mission even across the national borders by using a model EUROCLIO, among other organizations, has been promoting and implementing for many years. The next steps within this project are in-service teacher trainings for teachers in three EU countries, as well as capacity building workshops for members of parents’ associations, students and school boards in each country. Project Making History Work for Tolerance: A Research-Based Strategy to Reduce the Intolerant Usage of History Teaching in the EU will end at the NEPC’s summer school in July 2014 where developed teachers’ materials, didactic approaches and findings of the research will be presented and tested in order to be launched to other European countries as tools for increasing tolerance and reducing xenophobia.